In 1961, New York Yankees Roger Maris and Mickey Mantle found themselves in a hotly contested race to beat Babe Ruth's home run record. While sharing a mutual respect for each other's baseball-playing skills, they were pitted against one another in the media, where reporters and fans alike let it be known they preferred that the crowd-pleasing Mantle win the contest. 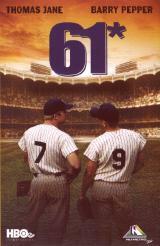 Based on the true story 61* is a riveting tale of these two extraordinary men and their struggle to maintain their friendship, sanity and Mantle's sobriety in the face of mounting pressures from the outside world.